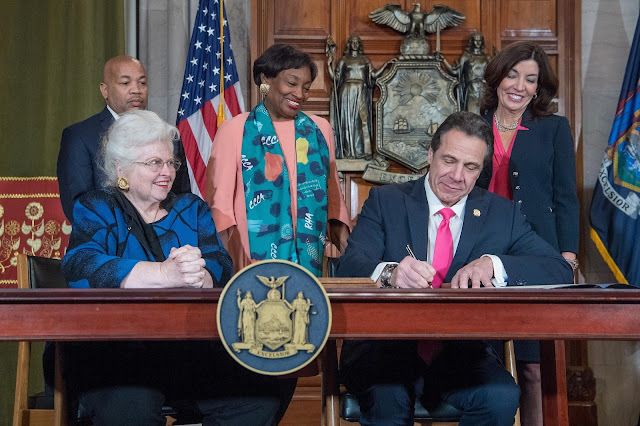 Check out these satans grinning it up as they sign their baby killing law into effect in New York. Just one of some 13 other states getting ready to advocate murdering a baby at the point of birth. All in the name of what? Freedom, of course, the freedom to be absolute No Gods No Masters in control of yourself and your baby, which you've just murdered. Well you can't get much freer than that; state sanction to kill your kids and throw off the tyranny of biology. Go on then, break the chains of oppression, wimmyn, but what will you say when the child you've killed looks you in the face in the timeless instant of eternity? Bad second of forever, but take heart. Remember the repentant thief and throw the first stone, then go away and sin no more. Sermon aside, what's with the Dems boosting full Moloch all of a sudden. Is this strategy or Satan overplaying his hand? Serious question. I don't believe the evil one ever overplays his hand. He doesn't have to because there are always souls for sale. 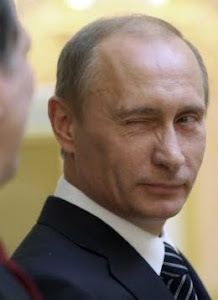 Evil greedy people overplay their hand, which often proves to be their undoing. No gods--No Masters. Then it follows that there is no Heaven and no hell, and no evil one. I sometimes ask such people if they believe in the evil one, and the answer in invariably "No". I reply "That's a shame, because he believes in you". When I first saw the animated movie "Heavy Metal", little did I realize how much of it would turn out to be prophecy. The faces of demons are evident in the reveling at the law freeing the murder of the innocent. And they call it progress. I would call it progress if we passed a law that created an open season on legislators who support murder (no bag limit). I mean, it should cut both ways. 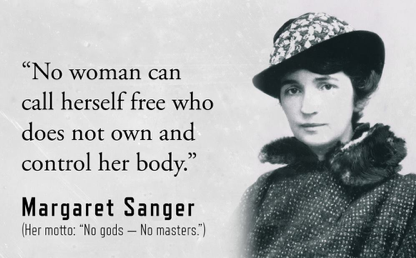 The whole "no masters" thing that Sanger pined for could and maybe should apply to the masters in the legislature who think that murder is cool. And that's the point. They think that its fun and possibly profitable to kill babies. But when you make murder legal, the whole retroactive birth control option rears its ugly head. Because if no life is sacred, then their lives are on par with the babies they are so thrilled at killing. Isn't that even MORE progressive? If I had more faith in humanity I would say the people would rise up and throw off these Democrats. But I don't have any faith in humanity. Fortunately it's not my world. It's God's and I do have faith in him. So anything is possible. With freedom comes responsibility. Sanger should have kept that in mind. Selfish of me but I'm grateful my time here is nearing my expiration date and others will be left to fight this evil. Never ends, does it? And I wonder at the possible hypocrisy of Cortez holding that button that seems to have a child's face on it while being upset that President Trump decries no late term abortion. Evil is definitely stepping up its game. Not just children. NYPD did their best to hide an MS-13 dude from ICE who had just murdered an American citizen. These vessels of human excrement need their own country that we can put up a wall between they and us. Have you seen the statue "the child who was never born" by martin hudeceka? Interesting distinction, RHT, and perhaps you're right, but consider the temptation in the wilderness. Satan starts off almost innocuously, turn these stones to bread. He then rises higher, to the roof of the Temple, throw yourself down, before taking Christ to the top of the world itself and offering him all the kingdoms of it. A diabolical ascension, if you like, at the peak of which Satan reveals himself fully as the anti-god. We see the same pattern or "reveal" with abortion. It starts with a lie and an appeal to physical well-being, abortion is healthcare. Moving upwards, it becomes a matter of freedom, of radical liberty. Then, finally, as in the wilderness with Christ, the gloves are off. Kill. Your. Baby. Right at the moment of birth. It seems, taking the wilderness temptations as a model, that Satan's driven to show himself, which comes very close to "overplaying his hand." Something similar goes on in exorcism, when the priest forces the demon to name itself. That said, his followers are rather less subtle. I'll watch Heavy Metal, again! Their bestial logic leads to the death of everyone everywhere until one thing's standing, and that's not human. In the Middle Ages they killed witches for killing children and we can see why, they were protecting humanity. I'm not saying Hillary should be burned on some some high street in the rust belt she helped gut to make herself rich, just LOCKED UP. Infidel, he was victorious on the cross. Anything is possible and let's not forget, the Word became a Man. He obviously trusts us more than we ourselves! I don't think Sanger was fond of responsibility, Jim. But the question is, was she an occultist? She was certainly in the right place at the right time, London, with Havelock Ellis. I think it'll only get worse, WSF. I fear for my kids. Then again, whoever said it'd be easy? Linda, I wondered at that button too. Cortez just signed a $10 million deal with Netflix, good change for a startup MillSoc leftist. We need multiple WALLS, Kid. Anon, I have and it's remarkably moving to me. I just looked up that statue. I wonder what the artist would think about all the women in America who are actually happy (gleeful?) about getting an abortion. And now what New York is doing. I do like the statement of calling the parents to repent. Some women have had more than one abortion. Just because. I know God would forgive them, if they were truly repentant; but are they? Probably not for me to question.